_03 APRIL 2014: 18:00H- LECTURE: "GUADUA ACTIVA" BY SPN STUDIO, LECTURERS: JUANA CANET & ELENA GÓMEZ, IN THE FACULTY OF ARCHITECTURE OF JORGE TADEO LOZANO UNIVERSITY IN CARTAGENA. 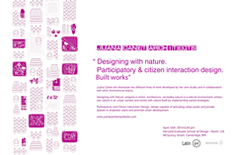 _15 APRIL 2014: 15:00H- JURY & LECTURE BY JUANA CANET ARCHITECS, "DESIGNING WITH NATURE & PARTICIPATORY AND CITIZEN INTERACTION DESIGN" IN THE ELIZABETH HERMANN´S CLASS IN THE SUBJECT URBAN DESIGN PRINCIPLES IN RHODE ISLAND SCHOOL OF DESIGN, PROVIDENCE, RHODE ISLAND, EEUU. _06 MARCH 2014- PARTICIPATION IN THE JURY OF PROJECTS CLASS IN THE ARCHITECTURAL SCHOOL OF FRANCISCO DE VITORIA UNIVERSITY. 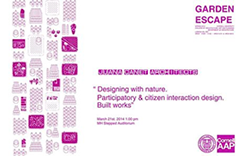 _21 MARCH 2014: 13:00H- MH STEPPED AUDITORIUM- JUANA CANET ARQUITECTOS LECTURE: "DESIGNING WITH NATURE. PARTICIPATORY & CITIZEN INTERACTION DESIGN. BUILT WORKS". GARDEN ESCAPE. SPRING 2014. CORNELL UNIVERSITY. COLLEGE OF ARCHITECTURE, ART AND PLANNING DEPARTMENT OF ARCHITECTURE LED BY LORENA DEL RÍO. NY. EEUU. _27 MARCH 2014: 18:00H LECTURE: "GUADUA ACTIVA" BY SPN STUDIO, LECTURERS: JUANA CANET & ELENA GÓMEZ,IN THE ARCHITECTURAL MUSEUM LEOPOLDO ROTHER OF THE NATIONAL UNIVERSITY OF ARCHITECTURE IN BOGOTA, COLOMBIA. 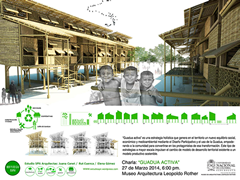 _28 MARCH 2014: 14:00H PROJECTS EXHIBITION BY STUDENTS ABOUT:"ENVIRONMENT & RURAL HOUSING IN COLOMBIA" & TALK ABOUT THE PROJECT "GUADUA ACTIVA" IN THE ARCHITECTURAL FACULTY OF THE JORGE TADEO LOZANO, BOGOTA.